During my RSI awareness presentations I refer to the need for people at risk of RSI as well as those who already experience its effects to adopt physical activities. Yoga is one of those activities that I suggest. Why yoga? In a nutshell, it combines a fairly physical activity encompassing muscle and tendon stretches from your head to your toes, with core conditioning and balance practices. This is coupled with controlled breathing techniques to allow the participant to focus their mind on the present moment. 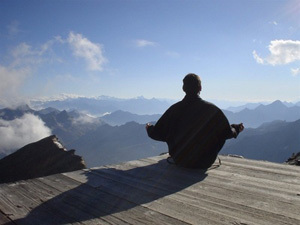 As well as the physical practice, yoga teaches techniques to promote deep relaxation and the ability to clear everyday thoughts from the mind with meditation. This powerful combination really can address a lot of the factors that lead to conditions like RSI (primarily driven by the overused micro-movements of muscles and tendons coupled with bad ergonomics and stressful working conditions). I have only relatively recently delved into yoga. For those of you who think it’s an activity for girls and hippies, I can assure you it isn’t! It’s really a great practice for everyone and there truly are no age or gender barriers. It can be quite physically involved, which I didn’t realise before I tried it out! I really wish I had started practising at an earlier stage in life while my RSI was not as bad as it is now, when it could perhaps have helped me to address my RSI condition during its early stages. I can honestly say the time goes by in a flash, and I always leave way more relaxed than before I arrived. It’s a great way to switch off from the working day. The Ashtanga class is fairly physical, and it may be a good idea for you to try to experience yoga at an easier pace first of all, and there are many classes to suit. You can also get many great yoga DVDs these days so you can try it out at home if you prefer (all you need is a yoga mat and motivation! ), before jumping straight into a class. I do however recommend trying to aim for a physical version of yoga, since this is what will help you achieve core strength and conditioning, giving your muscles a helpful intensive stretch based workout, coupled with relaxation and the ability to refocus your mind. It is perhaps the idea of channelling the hyperactivity of the mind into more useful positive energy and thoughts that is one of the key aspects of yoga. If we can control the over activity of our minds, we can achieve a positive state of mind and can face day to day stresses on a more even keel, ie. it can be adapted to many areas of your life. For example, are you perhaps over stressing a lot in the office? Then maybe a 20 min break away from your desk and a bit of controlled breathing and meditation can bring your mind back to a less stressful place, and begin to bring things into perspective, which can’t be a bad thing in these crazy busy lives we now lead now can it? An article from the San Francisco Chronicle highlights the benefits of Yoga practice in the high tech industry.